The William Davidson Institute (WDI) is an independent, non-profit education, research and applied practice organization established at the University of Michigan in 1992. Through a unique structure that integrates research, educational outreach, field-based collaborations, and development consulting services, WDI works with businesses, universities, development organizations, and governments in emerging economies to implement sound business practices and speed the transition to global engagement. WDI also provides a forum for academics, policy makers, business leaders, and development experts to enhance their understanding of these economies. 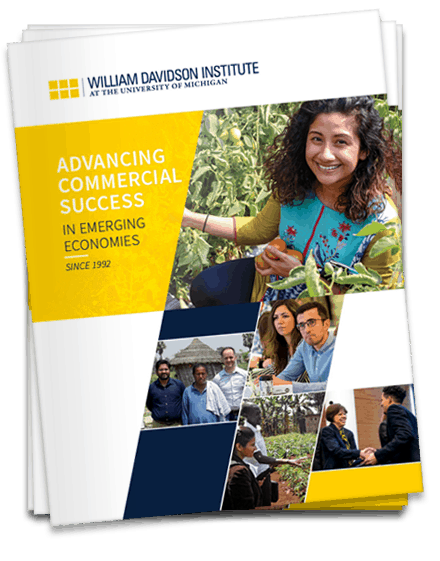 WDI is the leading U.S. institution of higher learning fully dedicated to understanding and promoting actionable business and public policy approaches to addressing the challenges and opportunities in emerging market economies. Learn more about WDI in this brochure (PDF). Interactive flipbook below. Nearly 6 million people have fled Syria's brutal civil war, with many settling in nearby Turkey. These refugees, as well as millions of other migrants around the world, often open restaurants and other eateries, drawing upon their cultural heritage to earn a living. The Livelihood Innovations through Food Entrepreneurship (LIFE) project was created to help these business owners – some 240 entrepreneurs will receive business support services offered at two food incubators. Many small and medium-sized enterprises in developing countries fall into the “missing middle”: They're too big for microfinance and too small or risky for traditional finance. To better understand this sector and how to support it, the Dutch Good Growth Fund (DGGF) commissioned studies on the entrepreneurial ecosystems of Benin, Cote D’Ivoire, Guinea, Mali, Senegal and Togo. WDI's Ekta Jhaveri discusses the research with Julia Kho, knowledge manager at TripleJump, an investment management and advisory services firm that manages DGGF’s Investment Funds Local SMEs effort. Author and professor Elmira Bayrasli sees a big shift taking place among entrepreneurs in developing markets: They're seeking opportunities in their home countries, instead of fleeing to Western nations. In this video dialogue with WDI's Amy Gillett, Bayrasli, who wrote the book “From the Other Side of the World: Extraordinary Entrepreneurs, Unlikely Places,” offers several other insights on what startup founders are really looking for and what they need to achieve it. Preventing research duplication in the global health arena is critically important – but it's also beyond challenging, given the large number of organizations working at country, regional and global levels. It's with these challenges in mind that organizers have launched MarketBookshelf.com, a new, one-stop platform for sharing global health market literature. The site aims to consolidate market literature across donors, sectors and health areas to improve – and ultimately change – how the global health market community disseminates its research. As the funding landscape for global health evolves, new financing models for the development and commercialization of medicines and diagnostics are needed. Priya Sharma of USAID's Center for Accelerating Innovation and Impact discusses the agency's forays into impact investing, and its recent report, “Investing for Impact: Capitalizing on the emerging landscape for global health financing” in this Q&A. In Ethiopia, use of herbicides as well as loss of habitat are causing a reduction in the local pollinator population, not unlike the global trend of pollinator decline that is threatening food security around the world. Julia Entwistle, a graduate student at the University of Michigan's School for Environment and Sustainability, details her summer internship with an organization trying to balance the interests of nature and farmers through profits.